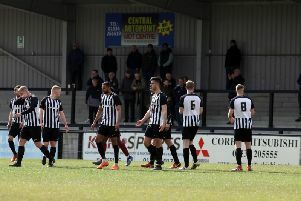 Spencer Weir-Daley knows Corby Town are in for “another tough game” when they make the mammoth trek to Truro City this weekend. The Steelmen squad are travelling down to Cornwall today (Friday) for an overnight stop ahead of the clash tomorrow. Tommy Wright’s team are aiming to rack up a seventh successive win in all competitions as they look to maintain their title bid in the Evo-Stik Southern League Premier Division. Having topped the table after the New Year’s Day win over Histon, Corby now find themselves third behind Weymouth and Poole Town after Hereford United’s record was expunged this week. Truro are one of the teams currently chasing a play-off place but striker Weir-Daley, who came off the bench to hit the winner against Histon, believes the Steelmen have already done plenty to show they can mix it with the best teams in the division. “It is another tough game because they are up there and have been winning games,” he said. “But the results we had against Poole and St Neots given us confidence and shown that we can beat the best teams in the division. Weir-Daley, meanwhile, is hoping he can push for a starting role this weekend after coming off the bench to grab the crucial goal, his 12th of the season, in the 1-0 success over Histon. The frontman was named as a substitute after missing the 4-2 victory at St Neots Town due to illness. And he added: “I want to start every game but I know that to do that you have to be performing every week and you have to be fit. “It was the right decision for me to be on the bench on New Year’s Day but hopefully I can push for a start this weekend.